At first, the daydreams were mild. She would hook the trailer up to an imaginary truck, and tow it to the beach. She could see the trailer glistening in the sun, the sand and the waves in the background. She could hear the surf and the gulls in her mind and smell the sea spray. The first encounters brought back memories of her childhood, playing with dolls with her friends at home. She had a couple of Barbies and always dreamed of adventure. The beach was always one of their first destinations. One of her chums had a Ken doll, and he had a truck. Now that’s what she needed now; a guy with a truck to tow her trailer. While she loved the vision, she missed the interaction with her girlfriends. Sitting in her comfy chair, Barbara came back to reality for a moment. She missed a lot of things lately. The divorce had been long, painful, and expensive. The big house on the hill was gone, and many of her closest friends were hundreds of miles away. Her two kids were grown and living back east, busy in their own lives. The room she rented from a long time friend in the old part of Carlsbad was nice, but the move from the Bay Area cost her so many friendships. Sure, she could call on the phone, but it wasn’t the same. You couldn’t have those deep conversations like she used to have and, she laughed, you certainly couldn’t play with dolls and a pink trailer on the phone. When Barbara first moved to town, she took on a job at one of the boutique clothing stores in the Village. She met a lot of people and enjoyed the extra spending money the job provided, but one day there was a little sign on the door that said, back in five minutes. Unfortunately, the owner never came back and her part-time job was over. Now she was alone most of the day. Her landlord/friend worked all day. Daytime TV got old quickly, so she would go for walks, mainly to the beach and through the downtown area. She kept her eyes out for help wanted signs. On one of these walks, she passed one of the independent coffee shops in town. In the cool morning sun, there were a number of women in vibrant conversations outside. She so wanted to sit down and join in, but all the chairs were taken. She got a coffee and continued her walk. The next day she started her walk earlier. She thought to herself, I’ll get there earlier and snag a chair. This worked great except, the other women pulled chairs to the other tables. She had a coffee and a table all her own. As she sat there, a tear came to her eye. Here she was in a vibrant downtown area, sitting on a nice sidewalk close to the beach, yet she felt so alone. There were people around and wonderful conversations going on, but she wasn’t part of them. Her longtime friends were so far away. Her kids were living their own lives. She needed to do something. That’s when an idea came to her. The following day Barbara took out a large shoulder bag and arranged things inside. She left her house early and stopped by the antique/thrift store on her way to the coffee shop, picking up a few older items. Now she was ready. As she approached the coffee emporium, she staked out a good chair on the edge of the sidewalk facing the street. She ordered a coffee and muffin and then was ready. She sat down at the table and put her large handbag on the chair next to her. Over the next five minutes, she set up the table in front of her, her pink trailer as the centerpiece. Next, she brought out the three vintage dolls that she picked up in the store and laid them out. Then with a stroke of a sharpie pen, she took out a folding tent card and wrote in large letters, Come Play! At first, the few patrons at adjacent tables just stared at her. Barbara sipped her coffee and broke off a piece of muffin. Down the street, a group of women approached. As the walked by, one of them stopped. Everyone cracked up. The two guys took a seat and the conversation went back to the sixties and seventies. That my friends is how Barbie and Ken met. It’s a year later now, and the couple was married right in front of the Carlsbad Coffee Emporium. Ken has his Tonka Special Edition Chevy pickup, and Barbara has her silver Airstream trailer with a pink sign on the side that says I heart U. 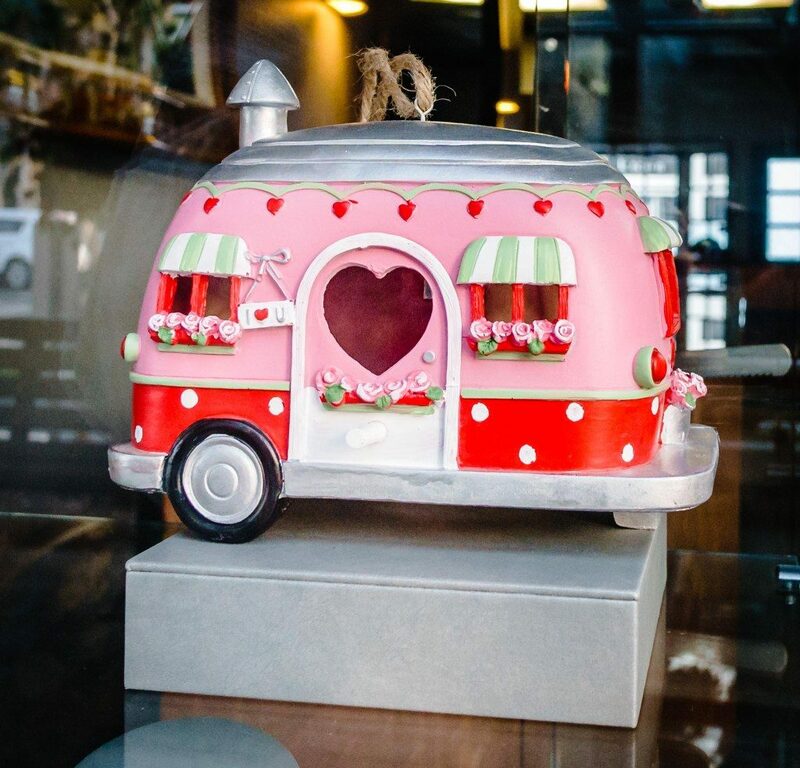 Inside the trailer is a pink and red airstream trailer with Barbie and Ken dolls sitting outside. Destination Heaven. While this is a work of fiction, the trailer is real. Still sitting in the display window in Carlsbad California, waiting for someone to take it out for adventure. Will that someone be you?